It’s almost unbelievable to say, but after receiving Ashlee and Mike’s wedding inquiry, and exchanging just a few emails with them, we had a strong feeling that we were a perfect match! We first met them at the Cibolo Nature Center for an engagement session and quickly found that our intuition was 1000% correct! As we filmed and photographed them during their session we knew that it was the start of something special. Their wedding was at Featherstone Ranch in Stonewall, TX just east of Fredericksburg. 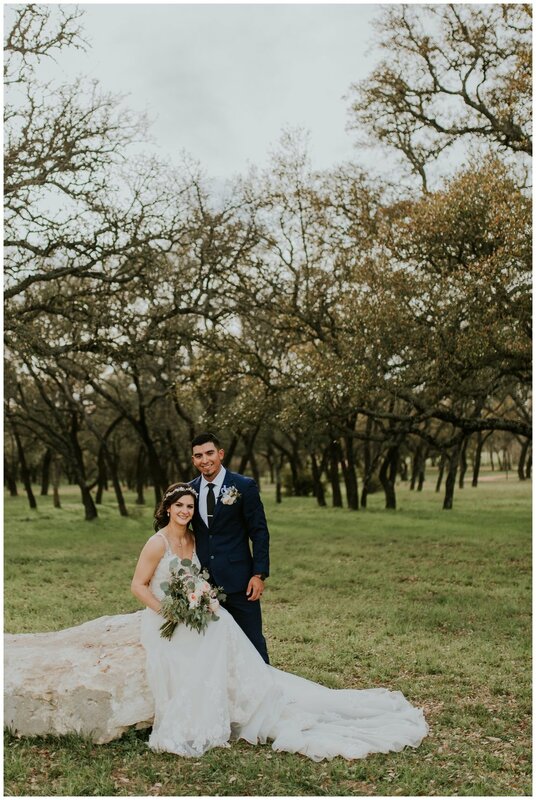 When we arrived at the venue we were floored by the beauty of the bright, open-air ceremony chapel and the hill country views that made for the perfect backdrop for sunset photos. Before their wedding ceremony began, Ashlee and Mike shared in a first touch, separated only by the tall white barn doors of the ceremony chapel. After holding hands, Mike led them in prayer and tears filled their eyes as they reminisced on everything that brought them to this day and on everything still yet to come in their future as husband and wife. At the end of the night when they exited amongst sparklers held by friends and family, we watched them drive away and our hearts were so full for the story we would tell and for the friends we made along the way. We are so thrilled to have met Ashlee and Mike and we are so excited to share these images of them as husband and wife. Thank you for the memories, for your laughter, friendship, and inspiration. We are grateful to have captured your wedding day and for the many lives you will touch in your work as educators, inspiring and leading our next generation of students. Your love will be seen not only by your friends and family but by every person that steps into your classrooms and passes on the values and morals that shine through you. To have captured your great union was our honor in contributing to the beginning of an exciting and passionate love story. Want to see the full gallery? Request access below, we’ll send you an invite once it’s complete! I'm interested in receiving emails regarding Couple Session and/or Family Session model calls in the future. I'm not interested in receiving these emails. Thank you for requesting full access to the Trevino gallery. Once the gallery has been finalized and released, you will receive an email invite. © 2019 Contista Productions. All Rights Reserved.